Namdas said the Electoral Act has made provisions to enhance digital identification as a requirement for voting, stating that no Nigerian should be deprived of voting due to card reader failures. The spokesman of the Federal House of Representatives, Abdulrazak Namdas, says that were he in a position to advise President Muhammadu Buhari on the amended Electoral Act, he would ask him to sign the bill into law. The lawmaker explained that the President and several members of the current administration have been helped by the electronic voting process and that the content of the current Electoral Act would go a long way to enhance the credibility of elections in the country, bringing credit to the President. Namdas made the remarks Monday while fielding questions from newsmen in Yola, the Adamawa state capital. Namdas said President Muhammadu Buhari and APC have made progress since taking office in 2015, adding that Buhari has set the country on a path to economic and industrial revival by investing in extensive infrastructural projects across all geo-political zones. “No president in the history of Nigeria has invested in massive infrastructure like President Buhari has done,” Namdas explained. “These infrastructural investments are what Nigeria has been lacking for several decades, and this will ultimately turn around our economy and move the country forward. To illustrate what he considers the President’s positive impact on infrastructure development, Namdas mentioned that his constituency, Jada/Ganye/Mayo Belwa/Toungo, for the first time, has benefited from a N22 billion federal road project, describing it as a move that has the potential to transform the area, which is considered the food basket of the state. Namdas lauded the President for understanding the sensitivity and significance of the project, saying the road would open links with Taraba state and the neighbouring country of Cameroon, and that it would been a boon for the largest game reserve in Africa, the Gumti-Gashaka park. He further explained that the road, when completed, would revive the struggling economic and agriculture activities in the area and create employment among local communities. However, the lawmaker lamented the abandonment of the already approved N6 billion dam project in the area. He said he intends to pursue the full implementation of the project, explaining that only N2 billion had been disbursed for the uncompleted project, with residents yet to be compensated for their expropriated lands. Namdas said that the hydroelectric dam on completion will reduce the burden on the national grid. 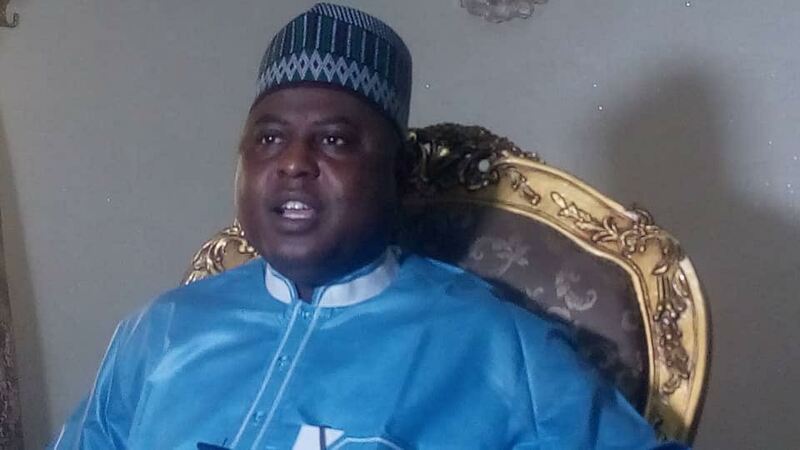 Speaking on the controversy surrounding the adoption of direct primaries by the state chapter of the APC, Namdas said, “There is nothing wrong with what the Adamawa state chapter of the APC did, because the party decided that the presidential primaries would be direct and the states should choose which method to adopt. I can assure you that some states even opted for a consensus candidacy. “It is normal that there are people that don’t agree with a position; they may decide to write to the national body of the party, and that is also in order; but the party would have to look at the number of people that have signed for the indirect as against the number that are against it. “The current set of executives and delegates were the executives of the former governor and when the governor emerged victorious he did not change the leadership. “So it is surprising that the people that have been with the former governor and are still in the party are the ones complaining. “About 95℅ of the delegates in the state were the delegates that had been with the former governor and it is the same people that are complaining that the governor has manipulated the delegates. It is not fair. On the issue of the ongoing National Assembly recess in view of pressing national issues, Namdas said, “We are officially on recess; it is not as if we deliberately decided to go away to avoid attending to the virement. “The National Assembly operates on a calendar and it was in our calendar to go on recess; but before we left we already had a first reading and the matter is before the committees who will bring an informed perspective to the floor of the House,” he said.